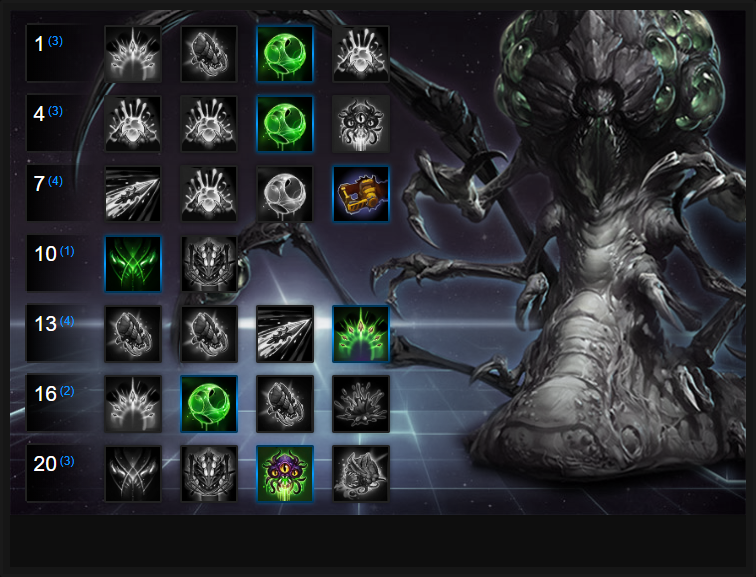 In this Abathur Build Guide, we provide an overview of its strengths, abilities and talents. Abathur is one of Hero of the Storm’s most unique Heroes. Rather than roaming the map like others, you use him to boost other heroes in your team through your Symbiote. Abathur is capable of pushing lanes by using his trait to soak and kill creeps, while bolstering heroes. He does require lots of skill to play well and you need to have exceptional map awareness because key to pushing lanes and gaining experience is rotating and "body soaking" with Abathur in lane. I know of many Abathur players that simply stay in one lane, Symbiote one person for far too long and do little else but use their abilities. It's not really the right way to play him as you should be making valuable use of your ability to soak experience in lanes, supporting all allies wherever they are but also pushing other lanes where possible. Unsurprisingly, Abathur is hard to play well. Locust Strain (Trait) - Locust Strain is effectively Abathur's body when in lane. As he can't stand and fight minions by himself (he'd simply die), he spawns a Locust every 15 seconds. The Locust will leave his body and trundle down into the nearest lane, before attacking the nearest minion. By default, it will allow Abathur to push a lane if there's no opposition (such as an enemy Hero). However, if there is opposition, even if Abathur uses Symbiote on his Locust he will still lose a lane. As his Locust has a relatively small health pool, its value is in gently pushing or softening a lane while soaking experience. If you can, try to always position yourself so your Locust can reach your lane quickly, but don't make your location obvious: players can follow your Locust back to you! Symbiote (Q) - Symbiote is Abathur's most powerful ability and it allows him to assist another unit, ally or structure. Once you've cast Symbiote on any of these things, you can then use your Symbiote abilities to protect your ally or harm enemies. Using Symbiote removes your ability to move Abathur, and you can only Symbiote one thing at a time. I'd advise that when you do Symbiote someone, use your abilities when appropriate but don't stay Symbioted if your abilities are on cooldown. There's little point remaining attached to a Hero as you can't actually do anything during cooldowns, so it's best to exit, place Toxic Nest's, or rotate lanes. It's also important to note that Symbiote facilitates Abathur's experience gain when nearby to a death. Simply put, if he soaks with his body next to minions in one lane, and uses Symbiote on his own minions in another, he can gain experience from two lanes at the same time. Toxic Nest (W) - Toxic Nest's are surprisingly strong and a valuable tool for Abathur. You can place them anywhere on the map (although the range is limited) and when planted, they'll turn invisible after a brief period. If an enemy player touches them, they'll explode causing damage. You can place a good handful of them, but be aware that they don't last forever and you'll need to keep replenishing them. Try to place them in strategic locations such as the entrance to The Mines. What makes Toxic Nest's so powerful is the fact you can use them three times and each Nest provides vision, allowing you to use your (Z) to tunnel to it. Evolve Monstrosity (R) - Evolve Monstrosity allows Abathur to target a minion or locust and evolve it. When he does so, the Monstrosity will erupt and you can control it. The Monstrosity is amazing at pushing lanes, and it gains strength from killing other minions, to a maximum of 40. Considering it also takes 50% less damage from minions and structures, it's incredible for pushing lane. Unfortunately Monstrosity is pretty predictable and most teams can see it coming, before killing it quickly. Ultimate Evolution (R) - When playing Abathur, your team is inevitably down a player due to the nature of your Symbiote play and the lack of a physical Hero (making early levels 4 v 5). Taking Ultimate Evolution allows you to clone any other Hero and as such, bring the play back to 5 versus 5. Although you cannot use a Heoric Ability, you can use your cloned Heroes abilities. Having x2 Kael or x2 Genji is amazing and for a brief period, can easily win you team fights. Regenerative Microbes allows Abathur to provide a small amount of healing over time to anyone with his Carapace. While the healing isn't huge, it provides some much needed sustain, and mitigates a considerable amount of incoming basic attack damage on your front-line. Providing further survivability, Sustained Carapace sees its shield increased by 40%, and also allows the shield to persist after Symbiote ends. Effectively, this allows Abathur to "hat" multiple Heroes, granting them a sizeable shield and heal over time. Variable: Providing a 25% increase to attack speed, Adrenal Overload is amazing on fast melee Heroes such as Illidan or The Butcher. It's a huge damage boost for just about any Hero. Part of the reason that makes Abathur so frustrating to deal with, especially after the Tower changes, is Mule. Unless the enemy team go all in on your structures, Mule allows Abathur to keep them intact for a very long period of time. Ultimate Evolution is just about the only Heroic you should be choosing as Abathur. Due to the nature of his playstyle, the fact his body is never in a team fight makes any subsequent brawl a 4 versus 5. Taking Ultimate Evolution levels the playing field, allowing you to clone any allied hero. What's particularly strong about this is you gain access to all that heroes abilities and if you use it on someone like Kael'thas or The Butcher, that's double the trouble. Just be sure to use it during a team fight and not before otherwise your Evolution will run out of time before you need it. Soma Transference builds on Spike Burst, allowing it to heal the host for a percentage of the damage dealt. Factoring in the additional range offered, it can provide the host with a signficant boost of healing (especially if you also use Carapace for a brief shield). Further improving Carapace, Adrenaline Boost grants a 40% movement speed bonus to those who receive the ability. Considering its shielding, and healing over time, it's great for escaping and making aggressive plays. When you cast Symbiote on a Hero, you can now affect one other with Hivemind. Double the fun, double the damage, and shields. Your team is now effectively 6 versus 5 in all fights. This list of tips and tricks are just a handful of things we think will help your Abathur. We'll continue to add to the list as required and if you have any tips you'd like to share, let us know in the comments below and we'll place them here. 1. Abathur releases a Locust every 15 seconds. This can reveal your position if you place your body outside of protective walls. 2. Always try to assist melee or ranged assassins with your Symbiote - Illidan, Thrall and Valla are excellent choices. 3. Remember to regularly change lanes to soak XP. Your Locust will continually move into the nearest lane, so if enemy Heroes are on the bottom - move to the top and have your body out of sight, but near the wave (this reduces your Locust travel time). 4. Abathur doesn't have a mount but does have a travel ability that allows him to burrow underground to anywhere on the map that is visible to him. 5. If your team aren't under pressure, push lanes hard by using a Toxic Nest > Deep Tunnel to a quiet area of the lane. 6. During any team fight, always try to use your Heoric on an allied hero that can cause the most impact. Typically cloning a ranged hero such as Kael'thas or Jaina can bring a lot of instant value. 7. Key to playing Abathur is regularly rotating lanes. Use your Toxic Nests in bushes to grant you vision so you can quickly use your Z to travel to a new lane. 8. It's important as Abathur to "body soak" so that you're near to minions when they die so your team gets the experience. Hide in bushes in lane, but only when it's safe to do so. Thanks for reading our Abathur build guide. You can help support its updates by subscribing to Ten Ton Hammer. Here's the details.